Portofino, situated on the magnificent Riviera di Ponente, is the perfect destination for an unforgettable luxury wedding in Portofino, Italy. Wedding Portofino: The small harbor town Portofino is the Jet Set place of the Italian Riviera. Especially during summer Portofino is much loved by Italian industrialists, European nobility and international celebrities. Portofino stands for the good life. A wedding in Portofino is determined to become a wedding with class and style. The stunningly beautiful harbor is lined with expensive boutiques and restaurants. Colorful pastel houses are set along the quay and green hills are rising behind them. 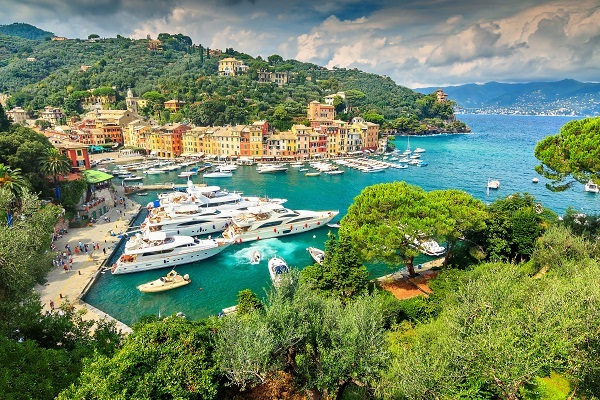 In the summer super luxury yachts, sailing and motor, anchor in the beautiful port of Portofino in Italy. Portofino neighbor Santa Margherita is definitely also a perfect option for a destination wedding on the Italian Riviera, the Portofino and Santa Margherita area. Santa Margherita offers a palm-lined harbor, a small sandy beach, exclusive hotels, private villas and nice Italian restaurants. For couples wishing to get married in Portofino or Santa Margherita the area offers the most charming wedding venues for a wedding reception on the Riviera. Luxurious restaurants, rustic trattorias or the charme of a private villa or castle are the perfect frame of a wedding in Portofino or a wedding in Santa Margherita. From private beaches to sunbathing terraces the Italian Riviera around Portofino offers the most charming venues for symbolic or protestant ceremonies and wedding receptions. For all catholic ceremonies Santa Margherita has beautiful churches. like Portofino and Santa Margherita are the most elegant destinations for civil weddings, catholic marriages or symbolic weddings along the Italian coast. Contact our wedding planner for a fine selection of wedding venues and locations in Portofino. We plan and organize your wedding in Portofino!